Saudi Arabia reportedly demands that Hamas stop its rapprochement with Iran in exchange for help in lifting the "siege" on Gaza. The Hamas-affiliated Al-Rai website reported on Monday that Saudi Arabia recently sent an angry message to the Hamas leadership over the group’s rapprochement with Iran, which Riyadh considers to be an enemy of the Sunni Muslim world. According to the report, senior officials in the Saudi intelligence contacted Hamas leaders and asked them to stop all contact with the regime in Tehran, offering in exchange to place more significant pressure aimed at lifting the "blockade" of Gaza. Palestinian Arab sources who spoke to the website said that the Hamas leadership is considering the Saudi request and has yet to respond to it officially. 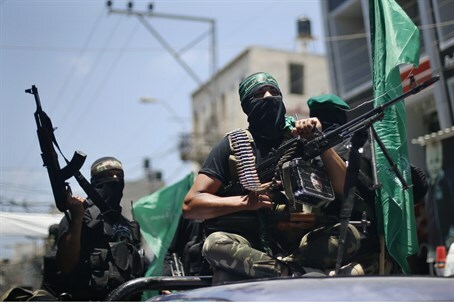 Just last week, a delegation from Hamas arrived for talks with Iranian officials on repairing ties between the two, local media reported. The Iranian Tasnim news agency said the team was led by Hamas political bureau member Mohammed Nasr and included Osama Hamdan, who is in charge of international relations. Iran has been a key source of funds and weapons for Hamas. Iran was once a stronger supporter of Hamas, but the two have been at odds over the uprising against Syrian President Bashar Al-Assad. As a result of Hamas’ refusal to support Assad in the uprising, an angry Iran reportedly stopped supplying the terror group with weapons. Nevertheless, the two sides have been getting closer in recent months. The speaker of the Iranian parliament, Ali Larijani, recently boasted that Iran provided Hamas with the technology it has used to rain down rockets on Israel from Gaza. Saudi Arabia also was not pleased with the policy of the Muslim Brotherhood in Egypt, under ousted president Mohammed Morsi, who preferred an alliance with Iran over Saudi Arabia and the Gulf states, and it was one of the key factors that helped the Egyptian military oust Morsi. Immediately after the army took power following Morsi’s removal, Saudi Arabia and other Gulf states pledged about $12 billion to the Egyptian treasury.